Invest in the right hanger for the right job. 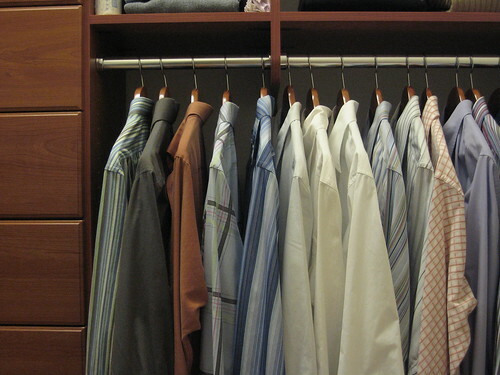 Use padded hangers for items such as dress shirts and blouses. They’re well worth the added expense because they’re ideal for delicate items. Opt for wood or larger, sturdier plastic hangers for heavy, bulk items such as coats. I’ve learned this lesson the hard way. I can’t count the number of cheapy plastic hangers that have snapped in my coat closet under the weight of our winter coats. Save yourself the money and the frustration, and invest in nice wood hangers that can stand up to such hard work, and keep your nice coats off the floor. Keep a pencil eraser handy for more than just writing mistakes. A regular, old pink pencil eraser works great for removing small scuffs from leather shoes, purses and coats. Don’t forget the stash of stain fighters in your medicine cabinet, too. Inexpensive and effective, a winning combination! Rubbing alcohol gets out ballpoint pen ink. Dab clothing with a bit of hydrogen peroxide to remove red wine and blood stains. White cotton cloths and dab, don’t rub should be the rule to keep it looking new. Cotton readily absorbs, and when you’re trying to remove a stain always, always, always dab it. Resist the urge to rub it. Doing so can actually help set the stain by pushing it into the fibers of the fabric rather than lifting it out. Lint brushes can quickly remove loose soil, pet hair and (obviously) lint, lengthening the time between washings or dry cleaning. Washing clothing too frequently can wear it out faster. Items that are worn over other clothing, for example, need not be laundered as often. To keep such items looking their best between cleanings, invest in a lint brush and use it. Underarm shields are inexpensive and can save your expensive clothing from unsightly pit stains. When purchasing underarm shields, look for ones made of cotton over synthetic blend as they’ll be more absorbent and therefore more effective. You’ll also want to look for the size and thickness that will fit you best, fitting closely to the body with minimal bulk. Last but not least, keep a regular stain fighting gel or spray near your hamper, too. If you keep your stain remover or pre-treating near where you place the dirty clothes to begin with, you’ll be more apt to catch stains before they actually go through the wash and increase your chances of sparing yourself from the woes of a set-in stain—or worse!—losing piece of clothing entirely.